Education Series Part 4 – Why Would Someone do an Exchange? Well, here it is. The fourth and final installment of our 1031 Exchange education series! This also marks the end of our first month using the new format. If you have been paying attention, you will remember that we have spent the previous three weeks discussing 1031 Exchanges. The first week, we talked about what exactly a 1031 Exchange is and the different types of exchanges that can be done. The next week was all about the strict rules that the IRS insists must be followed in order to complete a 1031 Exchange. Then, on week 3, we walked through the steps of a typical exchange. Finally, today we will be learning 5 of the top reasons someone would want to do an exchange. We realize that a 1031 Exchange and all that entails can seem overwhelming. 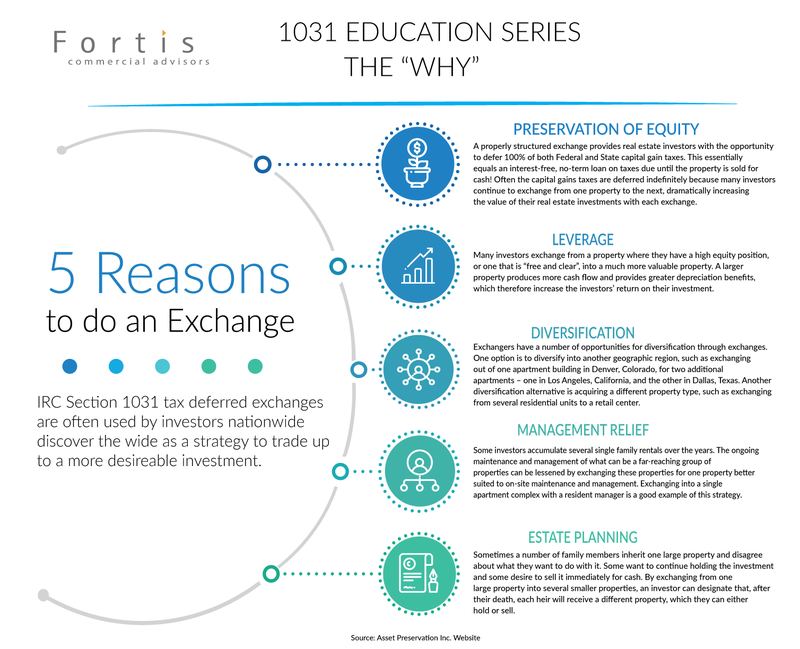 Luckily, the team at Fortis Commercial Advisors has the expertise and experience to help you avoid any problems and effectively execute your 1031 exchange. Since 2002 our principals have assisted clients in successfully completing 1031 exchange transactions across all product types. If you are considering an exchange or if you want to speak to an expert, please get in touch. We hope you have enjoyed this education series. Please stay tuned because we will be doing a new education topic every month and, who knows, it could be something you have always wanted to know! If you have a suggestion or there is a topic you would like us to cover, please contact us here, and we will try to put it into our rotation!